S.H. FIGUARTS SUPER MARIO BROS.
We finally get a look at the follow up to the recently released S.H. Figuarts Mario, his brother Luigi! We also get a look at some new prop sets based on the games. I am a little disappointed that they didn’t show more prototypes for this property. I’m assuming they’re still testing the waters to see how well the figures sell before they commit to more figures. I do hope they sell well and fare better than Toynami’s short lived Naruto line. Can’t wait for a Kakashi, Rock Lee and hopefully a Fourth Hokage! We’ve got a couple of additions to the growing Dragonball Z Figuarts line with Super Saiyan Vegito, Android 17, Android 16 and a look at Legendary Super Saiyan Broly. I’m glad to see new characters being added, but I am pining for the remaining Z fighters to be made. C’mon Tamashii, just make a Yamcha, Tien and Chao Tzu already! 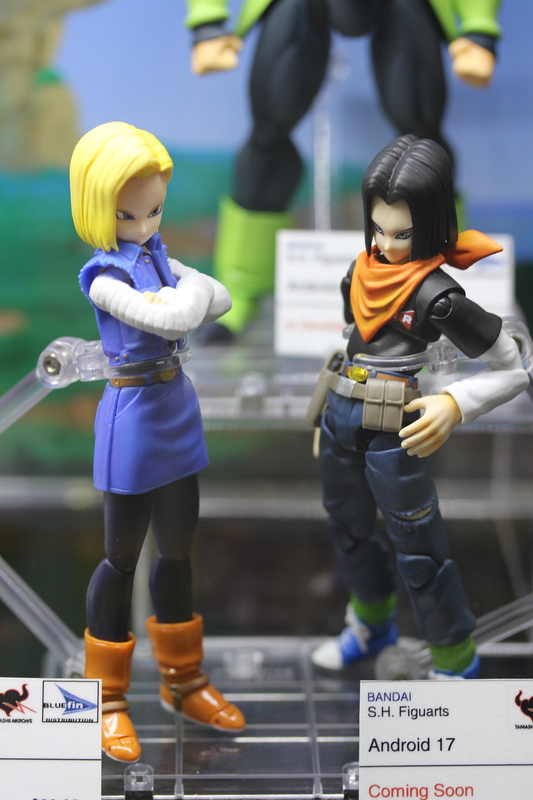 Here’s a look at a couple of upcoming DBZ statues. They look awesome! Bluefin’s booth also had some great DBZ dioramas. I can’t believe I missed taking a pic of Frieza’s ship! The Bluefin booth had on display a new line of 9 cm stylized figures called Tamashii Buddies. I was particuarly interested in kid Goku, perhaps I can fit him in my DBZ S.H. Figuarts collection? More pics in Part 2! Yamcha and Tien are definitely must haves. I don’t know why they’re not developing them yet. Android 16 comes with a damaged head and then his arms turn into cannons so that’ll be awesome. I pre-ordered Broly but I may actually order another one. Next Next post: Can’t Get Enough Guardians of the Galaxy? Hunt Down the Rocket Raccoon Labbit!